Context is becoming king within search engines like Bing. One of the complaints I recently had with Bing’s ability to search news involved its seeming inability to generate search results with sufficient information density. On Monday, Bing coincidentally released a new “spotlight” feature that promises to help. 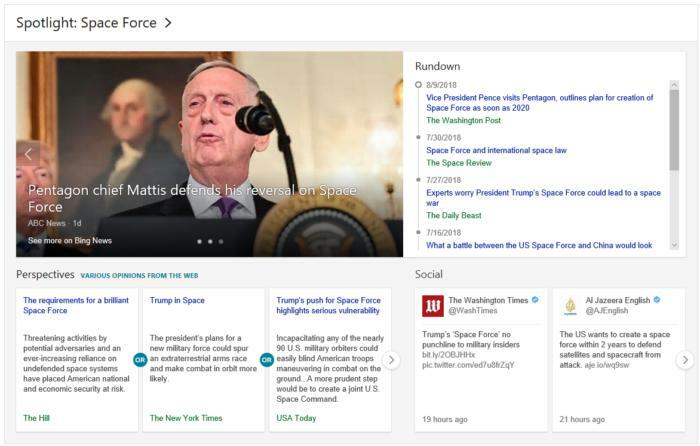 The Bing spotlight feature consists of three different areas: a timeline that tracks major evolutions in the story or topic, and various news perspectives, as well as the large "hero" image that features breaking news. Both perspectives and stories are compiled using a combination of both AI and experienced human editors, according to Bing. What merits the spotlight treatment? According to Bing, the site tracks "queries and browser logs, and document signals from publishers such as how many publishers cover a story, their angles, and how prominently they feature the story on their site." Sources must meet the PubHub News Guidelines, which evaluate a source for originality, readabiity, transparency, and more. Microsoft's Bing team suggested you try out a search for "self-driving cars" to check it out for yourself. The new spotlight feature is available on mobile as well as on desktop. What this means for you: Context is the new frontier for search engines, which have evolved into more than just an answer to a question. Now, both Google and Bing attempt tosurround your query with supplemental information—and encourage you to keep delving deeper.